This spacious 2BR condo sits in the heart of South Padre Island and features panoramic Gulf Coast views from a private balcony. This second-floor unit is decorated with classic beach-inspired design elements and includes tile flooring throughout. This beachfront property offers abundant amenities including a heated pool, hot tub, tennis courts, sand volleyball, and direct beach access. Free shuttle service is available to nearby shops, decadent restaurants, and bustling nightlife. Sprawl out on the sofas in the living room and enjoy a movie on the 40” flat screen TV. An additional armchair offers a relaxing seat to curl up with a book. The well-equipped kitchen features all-white appliances and a breakfast bar with seating for four. Enjoy home-cooked meals together at the dining room table set for six. This condo includes two bedrooms that sleep six total. Two full bathrooms are each stocked with a complimentary starter supply of toiletries. The master bedroom is outfitted with a king-size bed, 32” flat screen TV, and access to the balcony. The en-suite is complete with a walk-in shower and large walk-in closet. The second bedroom features two full-size beds, a 30” TV, a closet, and en-suite bathroom with a tub/shower combination. Enjoy panoramic views overlooking the Gulf of Mexico from the private balcony. The covered space is complete with five chairs. 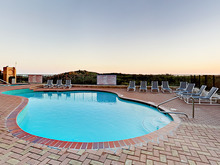 Amenities at the Suntide II complex include a heated outdoor pool, hot tub, tennis courts, beach volleyball, a community grill area, and convenient beach access. Parking is available for one vehicle in the parking lot, with additional parking on the street. A coin-operated laundry room is located onsite. Complimentary Wi-Fi is provided. All the attractions of South Padre Island are just a short walk or free shuttle ride away. The beach is a quick 2-minute walk from home. Water sports enthusiasts can find rentals at On the Beach for surfboards, paddleboards, and bodyboards. Or cruise the beach on bicycles, golf carts, and electric scooters from SPI Activities. Both stores are within a 5-minute walk from your rental. Enjoy a fun-filled day with the family at Schlitterbahn Waterpark, just 2 miles from home. Or walk 3 minutes to Gravity Park for go-karts, mini-golf, reverse bungee, and a climbing wall. Check out the menu at local seafood favorite, Blackbeard’s Restaurant, and don’t miss live music at the waterfront bar and grill Wanna Wanna-- both located several blocks away.